BlueWater Developments was born 2002 when owner Mark Imhoff saw an opportunity to become a limited company. With this new opportunity brought the chance to select a new company name. 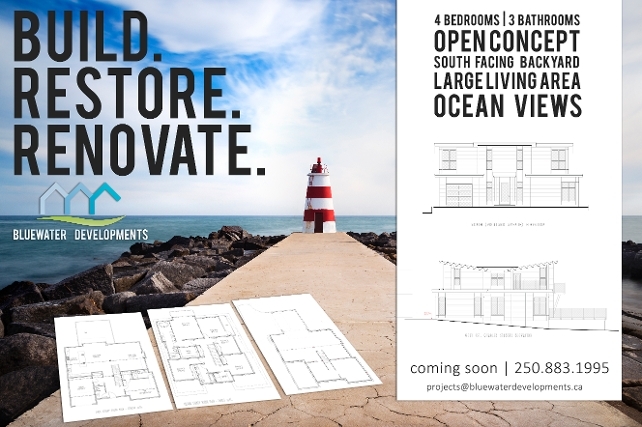 The name BlueWater Developments was inspired by the beautiful blue ocean water off Dallas Rd. Victoria, BC. Sitting on the deck of 236 Dallas Rd. Bed & Breakfast, a building designed and build by Mark himself, Mark couldn't help but announce glimmering the ocean water and it's vibrant colour. At that moment, BlueWater Developments was named. Previous to BlueWater Developments, Mark Imhoff has a long construction history. Operating the Mark Imhoff Construction team from 1992 to 2002 Mark and his team built +150 homes on lower Vancouver Island: ranging from Sooke, to Sydney, to Saainch to Victoria. "4 at The Park" - Brand new luxury 1,984 square feet townhomes located in James Bay, one of Victoria’s most historic & sought after neighbourhoods! In the new homes, you’ll fall in love with the upscale gourmet kitchen & the tranquil sunsets with ocean views from your master bedroom. Embrace the serene ambiance provided by the modern west coast design where every detail has been carefully thought out. Soaring ceilings with open floor plans, a private patio & a luxurious five piece ensuite, to only name a few, are all be yours if you live here. If you have been searching for a home that has been designed with outstanding care & quality, look no further than "4 at The Park" - custom built townhome to be completed in the Spring of 2016.